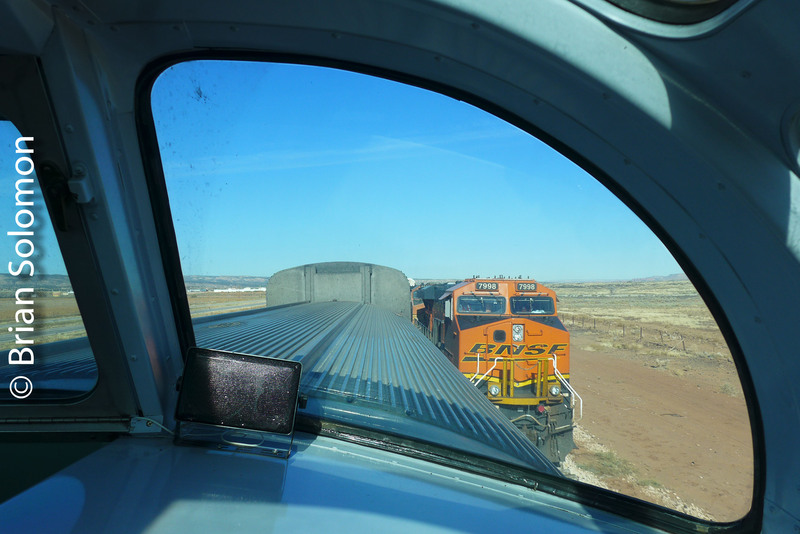 Classic Chrome: BNSF piggyback on the Rio Grande. The ‘Ides of March’ 1997; Sagers, Utah along Union Pacific’s old Denver & Rio Grande Western mainline. 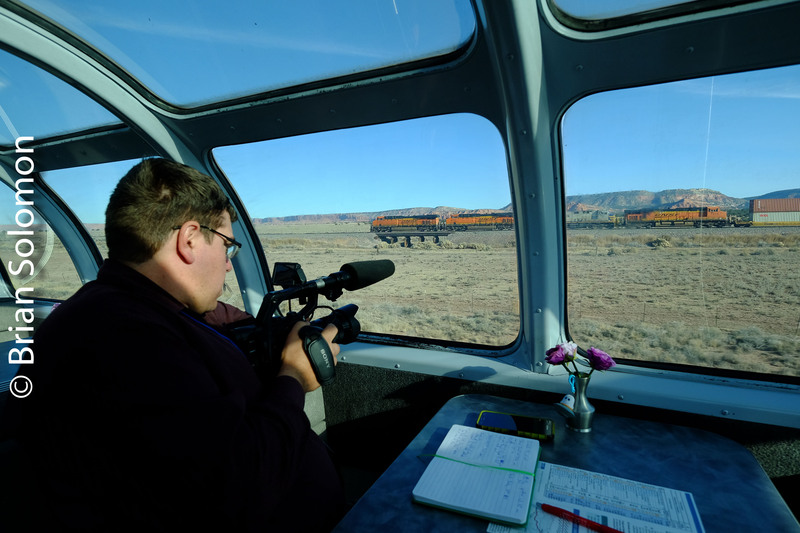 Fellow photographer Mel Patrick and I were traveling back from WinteRail ’97 (held in Stockton, California) and made a project of photographing trains in the Utah and Nevada deserts. 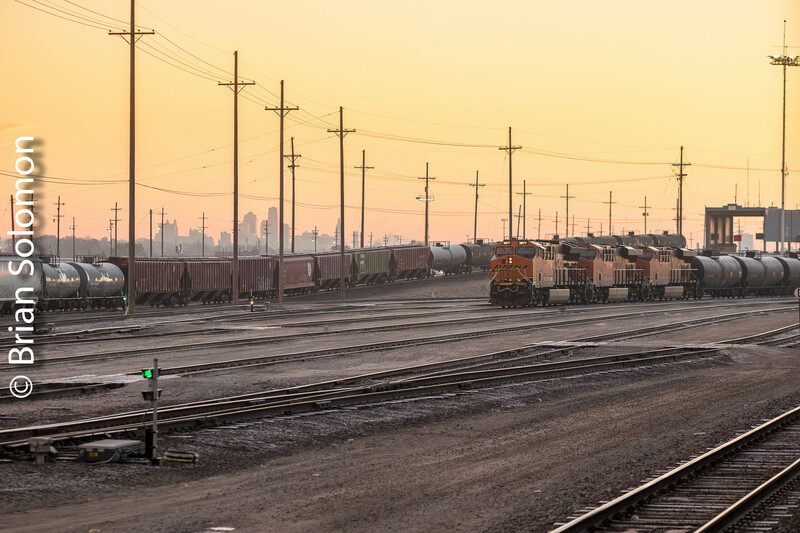 It was at 6:38 AM that I exposed this trailing view of a short BNSF piggyback train heading eastward toward Denver. 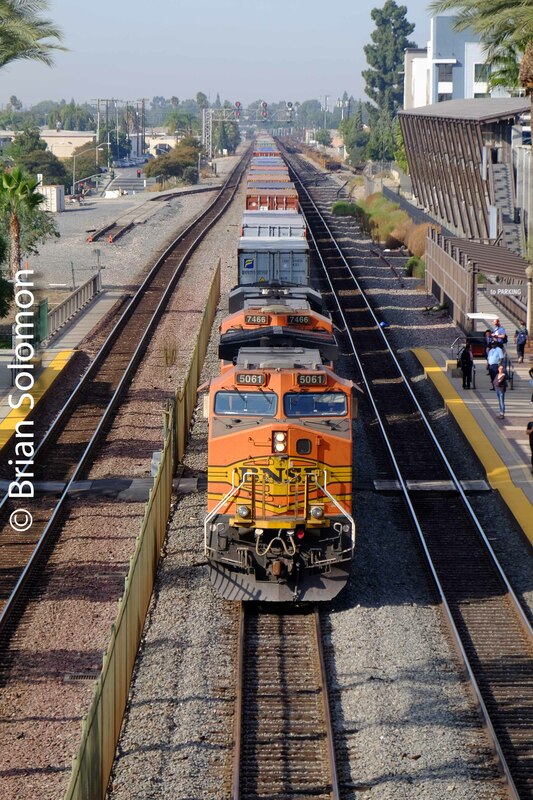 BNSF’s Four Fours. (It’s about a number). Just luck. Last summer John Gruber and I were along the mighty Mississippi at Savanna, Illinois and photographed a westward BNSF freight with DASH9-44CW 4444. That’s a lot of four. Low afternoon sun made for some nice light at Savanna. 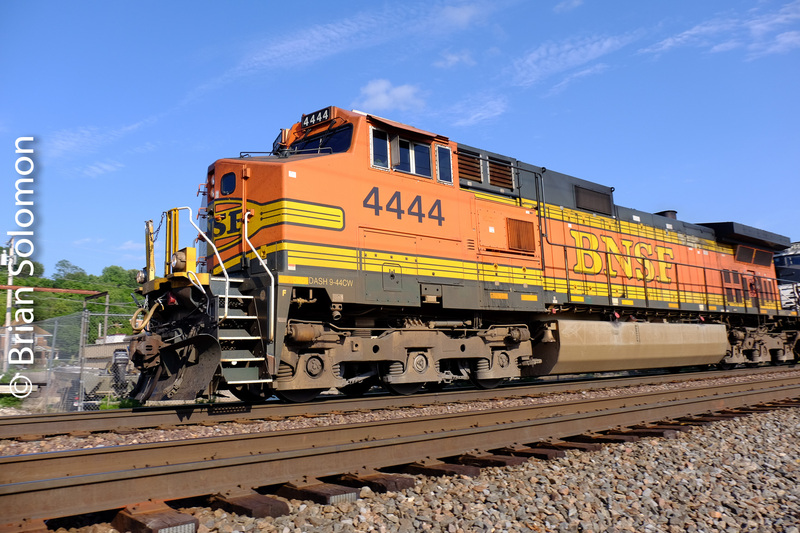 BNSF 4444 works west. Exposed using a FujiFilm XT1 with 18-135mm lens. 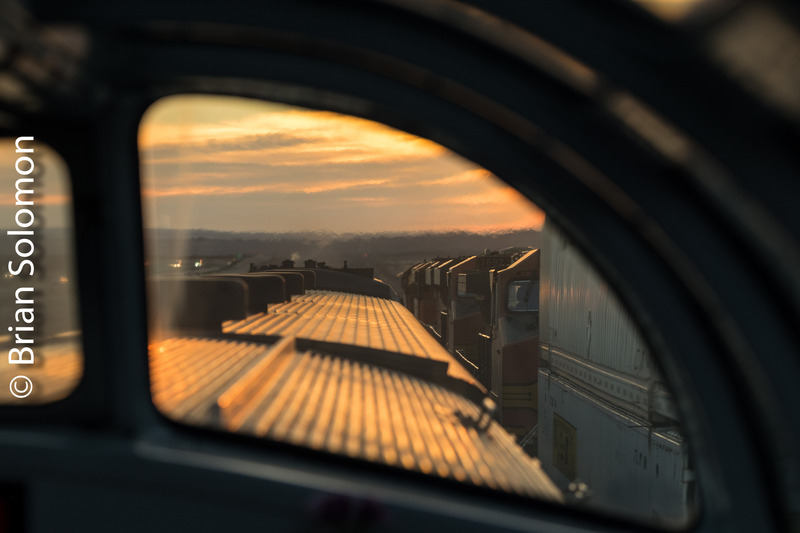 Looking Down on BNSF—Savanna, Illinois, July 2017. 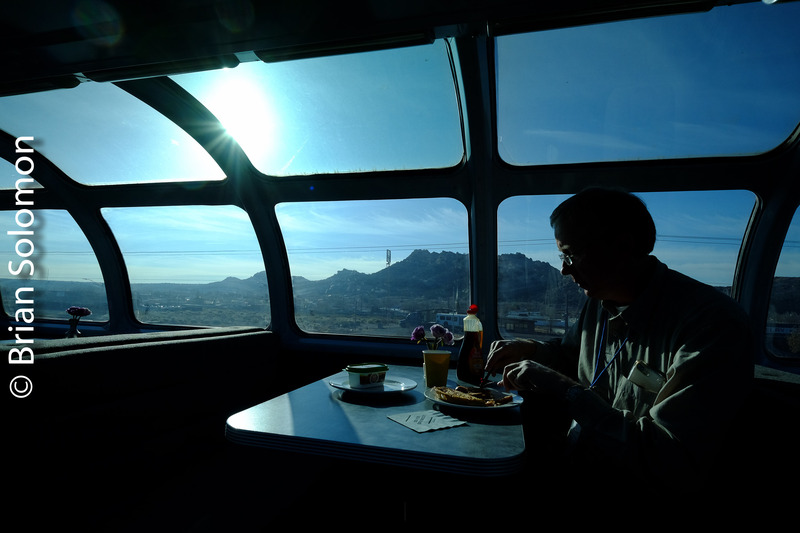 A long long time ago, back in the 1990s, I’d travel with Mike and Tom Danneman (and others) to the Mississippi River Valley to photograph the old Chicago, Burlington & Quincy route to the Twin Cities. Among our favorite vantage points were river-side bluffs in the Mississippi Palisades State Park north of Savanna, Illinois. The line on the east bank was Burlington Northern back then. 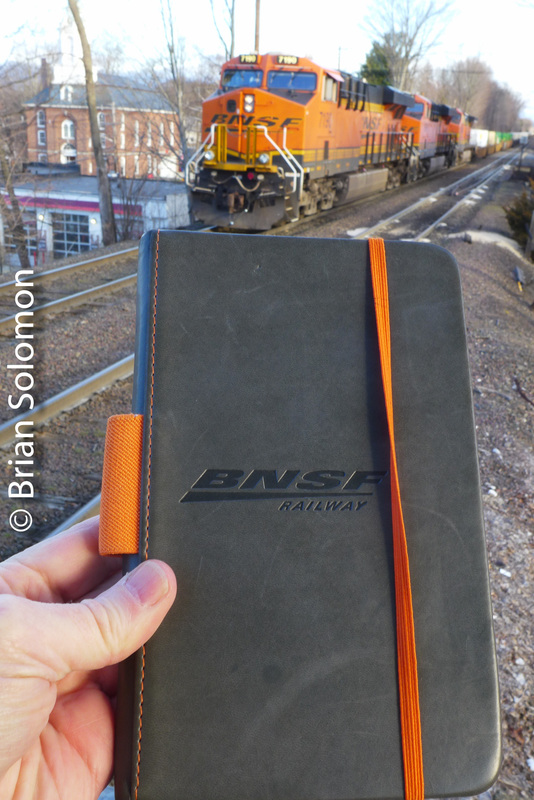 Today it is BNSF Railway (reflecting the 1995 merger between Burlington Northern and Santa Fe). On a bright afternoon in July, John Gruber and I returned to this old haunt and put ourselves in position to make a few photographs. 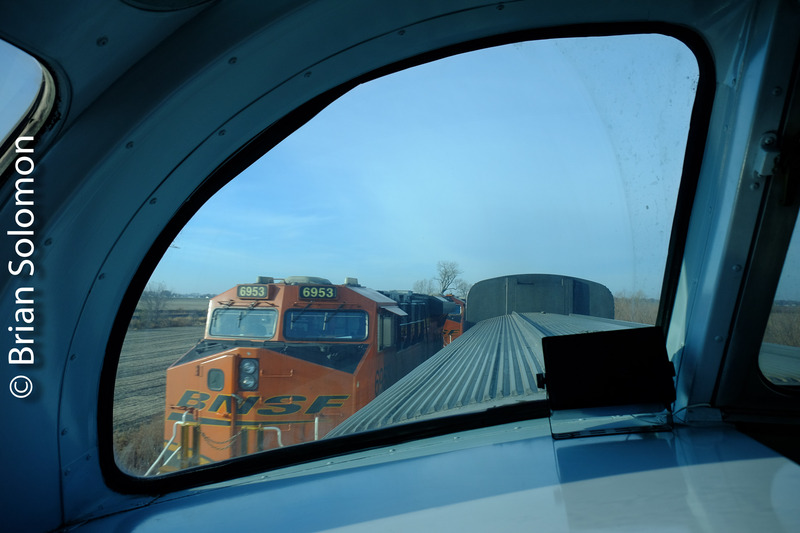 As hoped, BNSF operated several trains, and we exposed views from the tops of the bluffs. I made these with my FujiFilm X-T1. Looking timetable east toward Savanna. 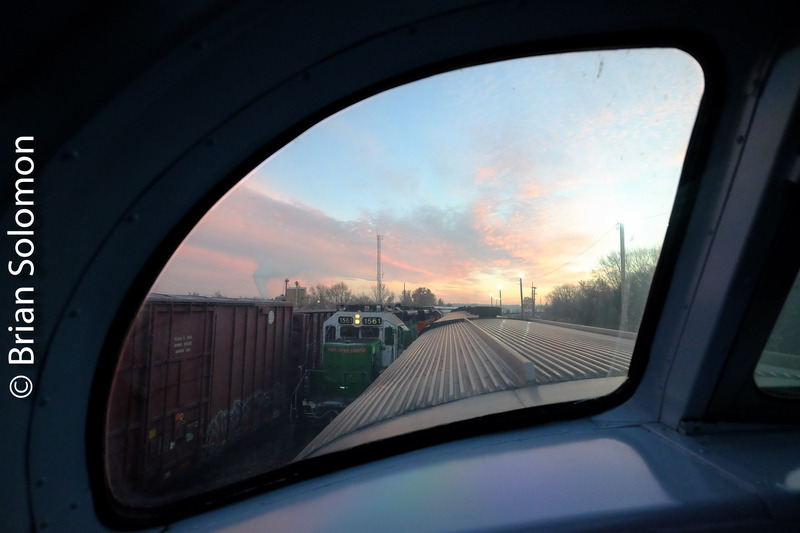 You can hear eastbound whistle for a crossing a mile or so before they come into view. A little glint off the river makes for nice atmosphere. Is this train carrying oil or ethanol? From this height I wasn’t sure. Like many trains in the West, this unit tank train had a DPU at the back. (Distributed power unit, railroad lingo for a radio-controlled remotely operated locomotive). A westward intermodal train races up-river toward the Twin Cities from Chicago. I remember when seeing a double stack train was a BIG deal. Look an old fashioned car load train! 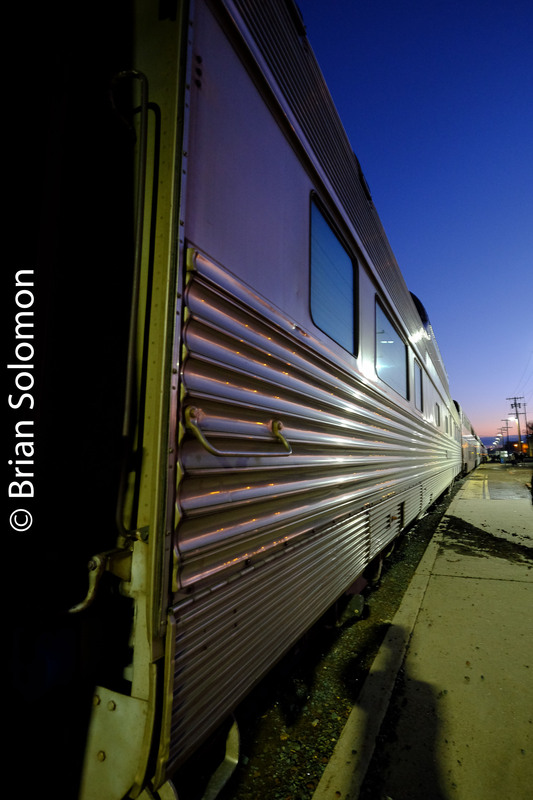 A couple of weeks back, John Gruber organized a speed-boat trip on the Mississippi River geared at watching trains. I learned a few things and found the experience exhilarating. 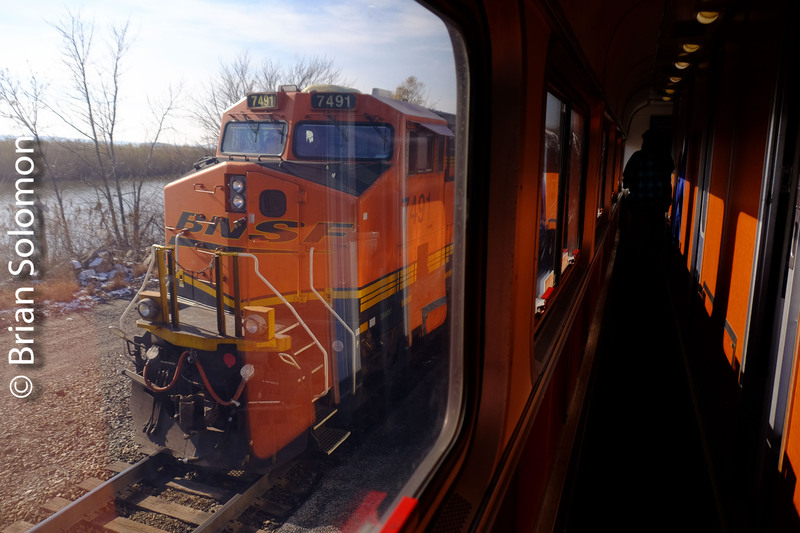 Here’s one of the views made of a BNSF train from the river near the Illinois- Wisconsin state line at East Dubuque, Illinois. Exposed with my FujiFilm X-T1. Bealeville Sunset—golden lining to the cloud of pollution. Dark clouds with silver linings? Not at sunset. Combine agricultural dust from the San Joaquin Valley with Los Angeles-area air pollution and you get some wonderful golden light. Throw in a few wild fires and it gets even better! All that pollution acts as a huge red-orange filter. On this evening in late July 2016, fellow photographer David Hegarty and I were fortunate to be in place in the California Tehachapis to make good use of the golden light. As previously featured on Tracking the Light, the railroad was a bit backed up. 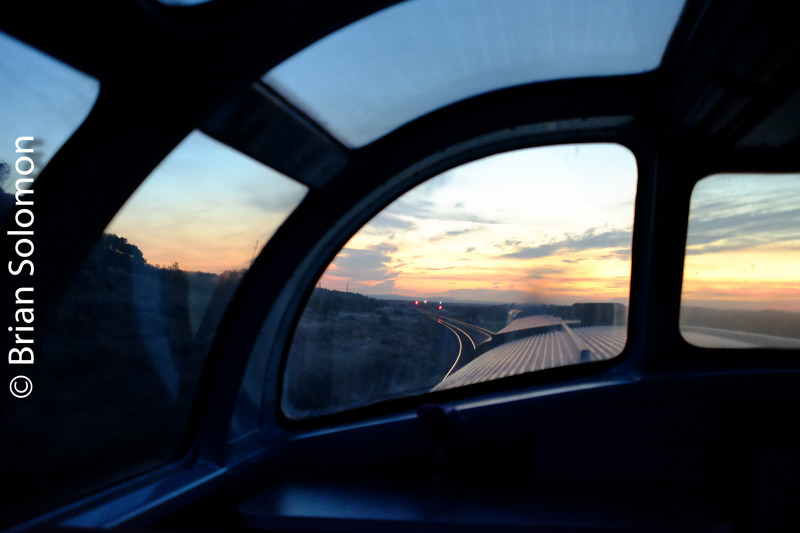 This enabled us to find a train at the moment of sunset. 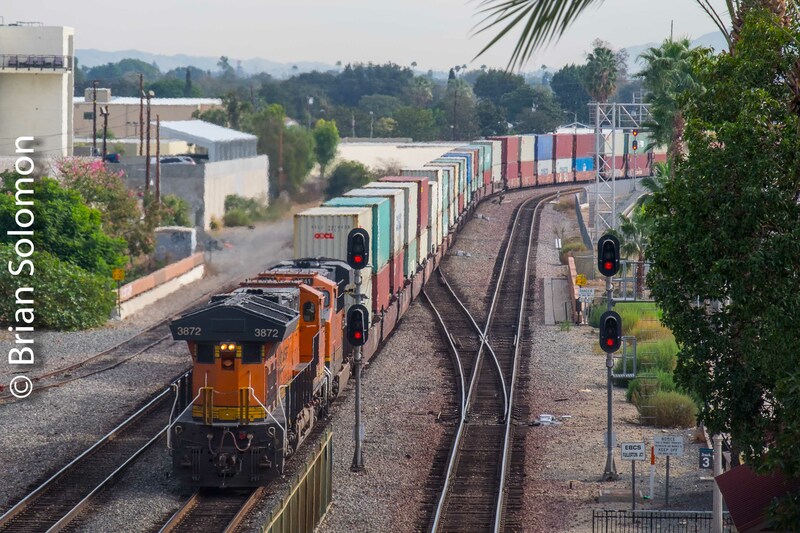 A timetable-southward BNSF freight gets a green signal at Belleville, California. FujiFilm X-T1 photo. Image was not altered in post processing except to scale for internet presentation. California golden glint; exposed digitally using a Fujifilm X-T1 with 18-135mm lens. Sorry about the wires. I’d crop them, but then the photo would have been ‘altered’. Right? Here I’ve included the setting sun. 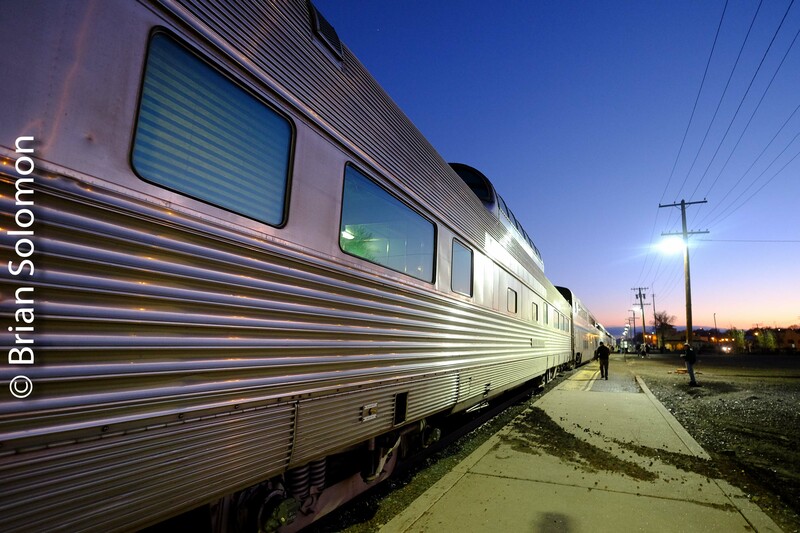 This shows the angle of the light relative to the train necessary to produce the glint effect. I’m standing at the Bealeville grade crossing. These images have not been altered digitally in post processing, except for scaling necessary for digital presentation. To maintain the rich rosy glow, I selected a daylight white balance, and was very careful with my exposure, which I selected manually to maintain texture in the sky. And yes, I also exposed a slide using Fujichrome Provia 100F. Caliente Traffic Jam—Traffic in the Tehachapis. Having been stuck in a few Los Angeles area-tailbacks lately, I’ll say, it’s no fun. 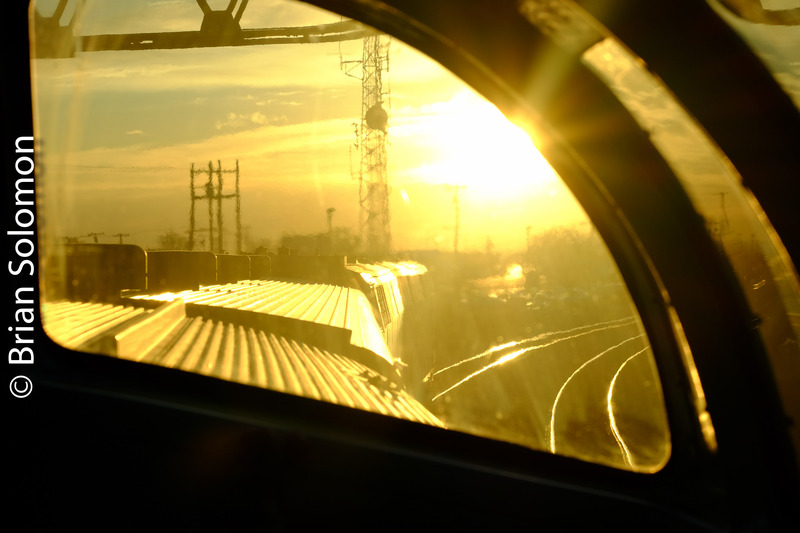 However, when the railroad gets jammed, it can make for some bountiful photographic opportunities. 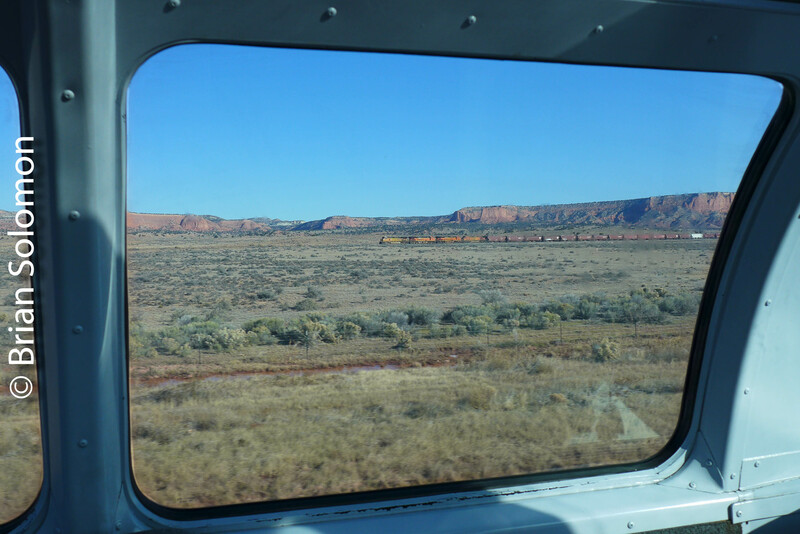 Union Pacific owns and dispatches the old Southern Pacific route over the Tehachapis, yet BNSF (operating on a trackage rights arrangement inherited from the Santa Fe ) runs the lion’s share of the traffic. 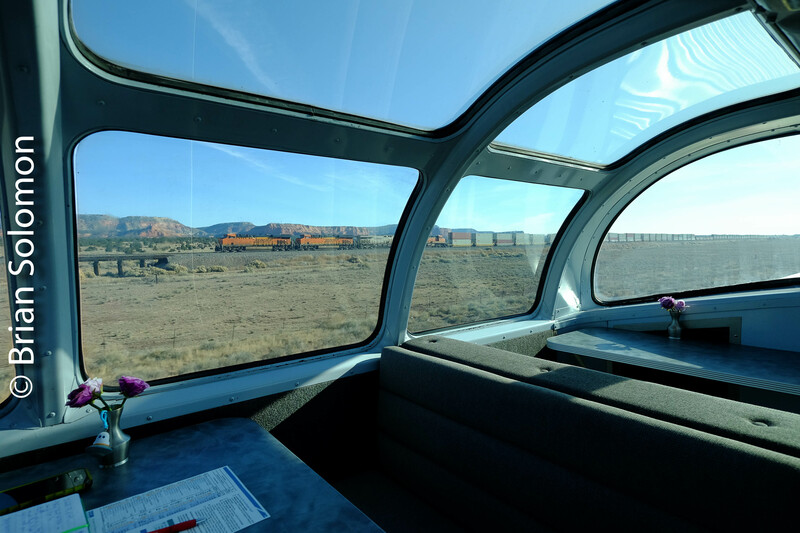 The mix of UP and BNSF plus outstanding scenery and blazing sun have the stage set. UP’s southward trains hadn’t faired much better; as a very heavy manifest had struggled upgrade at a walking pace adding to more congestion. 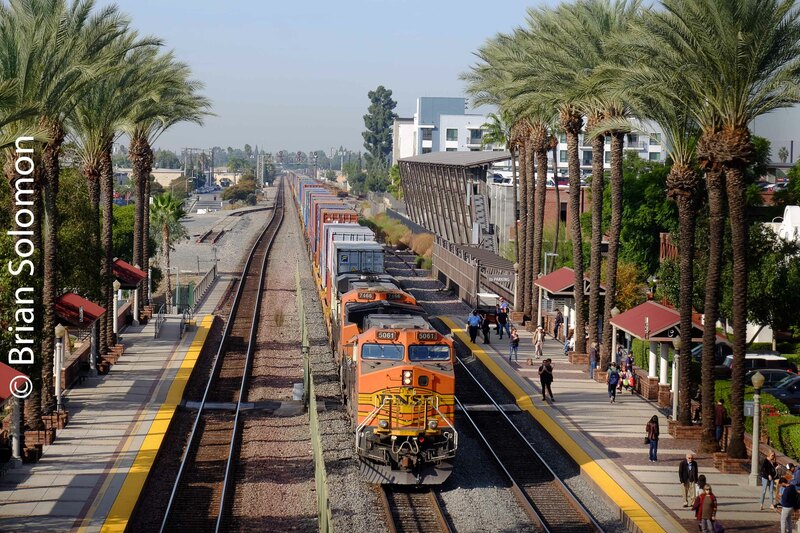 By evening, UP’s northward train had reached Caliente, where it held the mainline short of the first intermediate signal (as instructed by the dispatcher),while a BNSF southward manifest was in the siding. More southward trains were coming behind this train, as the loaded northward earthworm crawled downgrade and stopped at the pit of the Caliente horseshoe, short of the grade crossing. Three trains at Caliente and nothing moving. Furthermore, a pair of UP Z-trains were making a meet at Cliff. At this point it was like shooting fish in a barrel, to use another handy cliché, and the evening light was only getting better. Trains on all tracks and nothing moving; UP DPUs on the back of a northward freight holding the mainline, a BNSF northward train in the siding, while on the upper level of the horseshoe is the BNSF ‘Earthworm’ grain train, with its headend holding on the opposite side of the grade crossing behind me. Head-end of the Earthworm grain train. Just standing there in warm California sun. I think Kodak exited the Kodachrome business too soon! 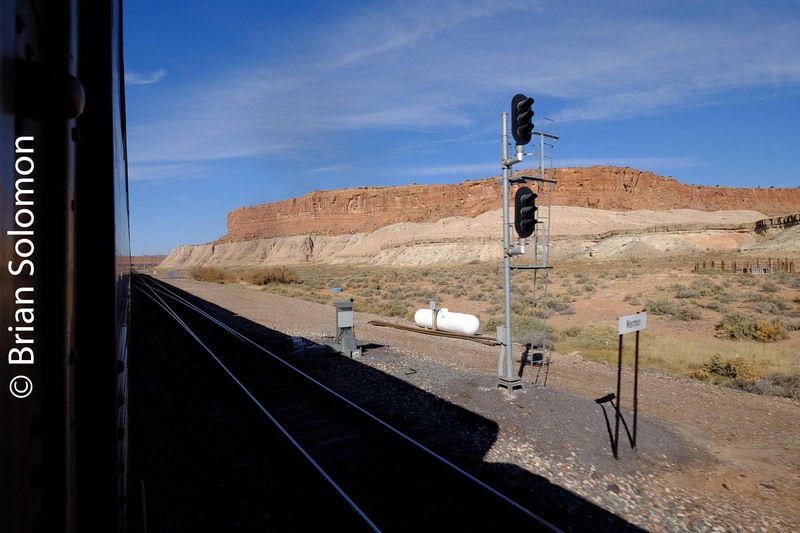 Finally, the BNSF Earthworm gets a signal. 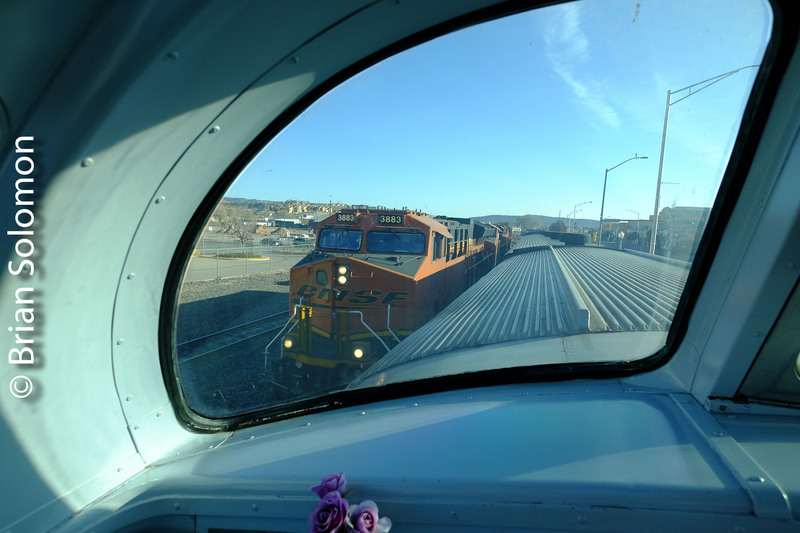 Here’s today’s photo lesson: By shifting the focus from the locomotives to the ballast in the foreground I’ve altered the natural perspective. Essentially, I’m tricking the eye into looking down and this focus combined with the pastel lighting makes the scene seem more like a diorama. Of course you may need to view this image larger than 3×5 inches to get the full effect. Ok, enough playing around, here I’ve focused on the main event as the rails have begun to squeal. Looking railroad timetable north (formerly this was west under the old SP timetable) the earthworm descends toward Bakersfield. 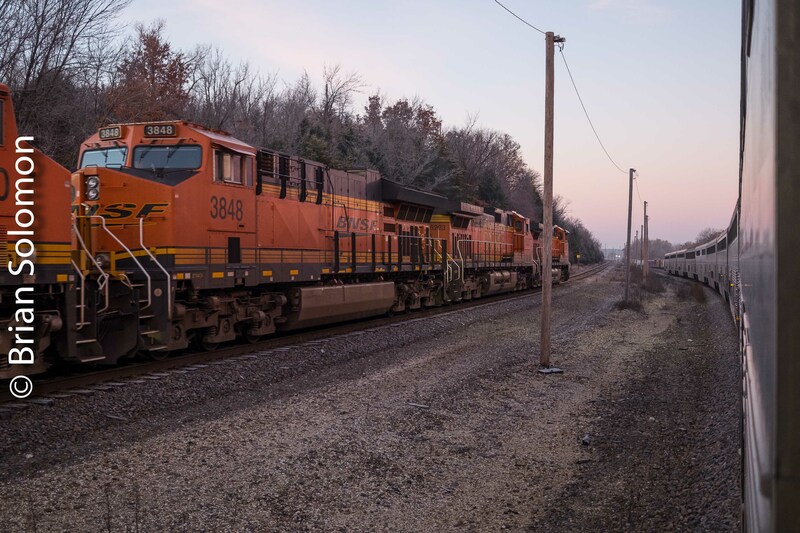 And a new BNSF GE-built Tier IV works as a second set of DPUs at the back of the grain train. Some quick driving to a pre-selected overlook granted me a final view of the Earthworm as it rolls along Caliente Creek. Who said, ‘you can’t have your cake and eat it’? Lost Treasure of the Golden Swoosh. Was it January 11th 2015, when word came over the wire? So far as I can determine, sometime ago a four-lettered shoe company produced a special runner (that’s an ‘athletic shoe’ in American parlence). And, this deluxe edition shoe carried a yellow tinted zinger on the side and was known as ‘the Golden Swoosh’. 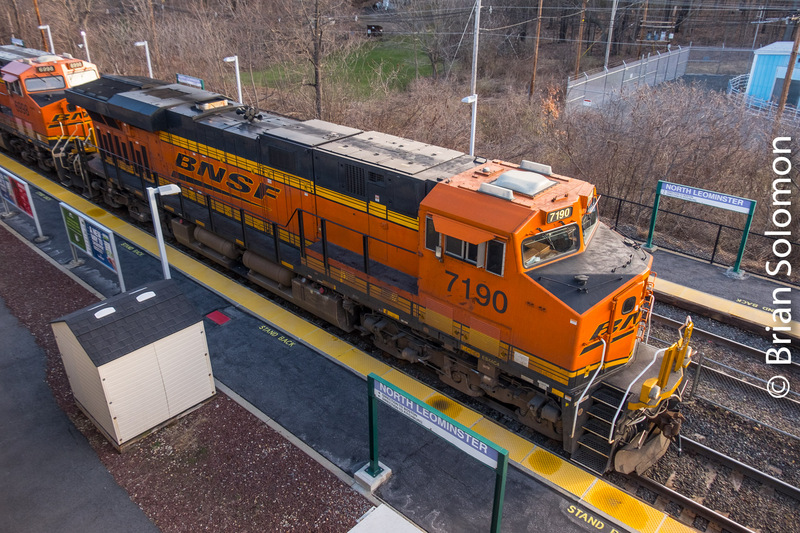 This curious term, it seems, was then transferred to a BNSF Railway General Electric Evolution-Series locomotive painted in a one of a kind variation of the company’s livery. 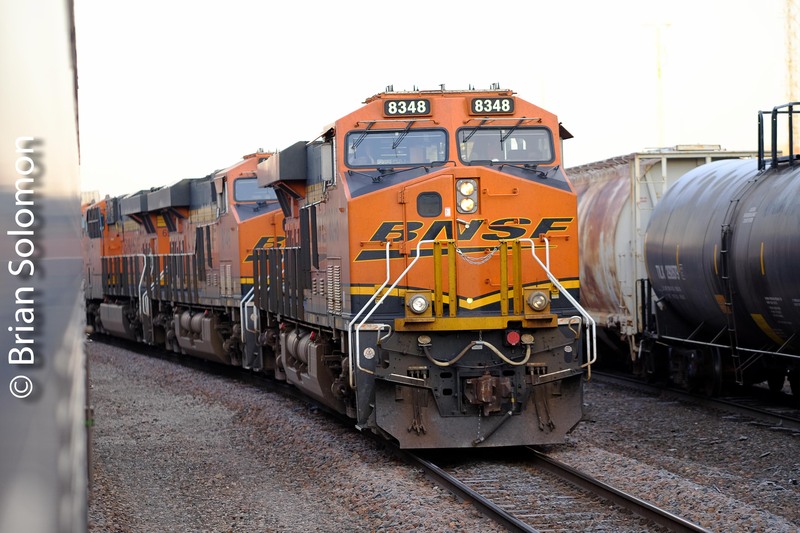 Instead of black lettering with angled underline (a ‘swoosh’ as it were), the ‘BNSF’ lettering and corporate underline logo was painted yellow thus creating a unique adaptation of the BNSF image on locomotive 7695. 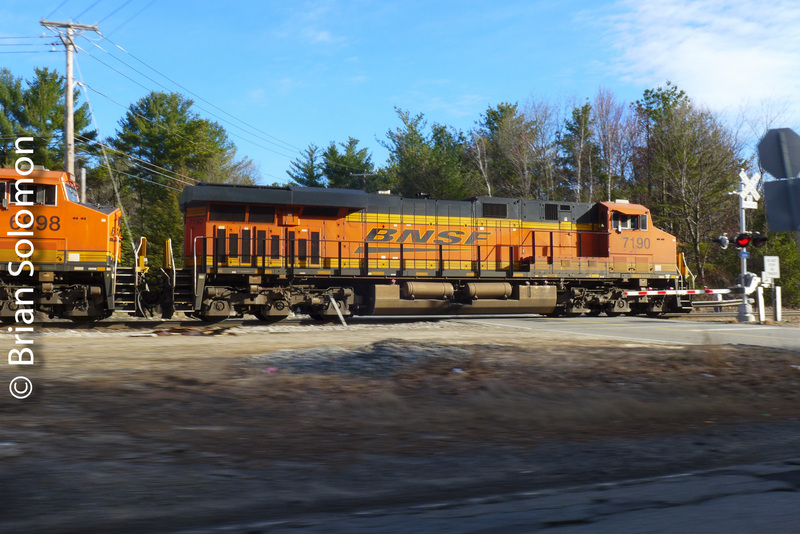 And this curious painted variation was eastbound on CSX leading a laden oil train destined for Philadelphia. The wire was live with reports. 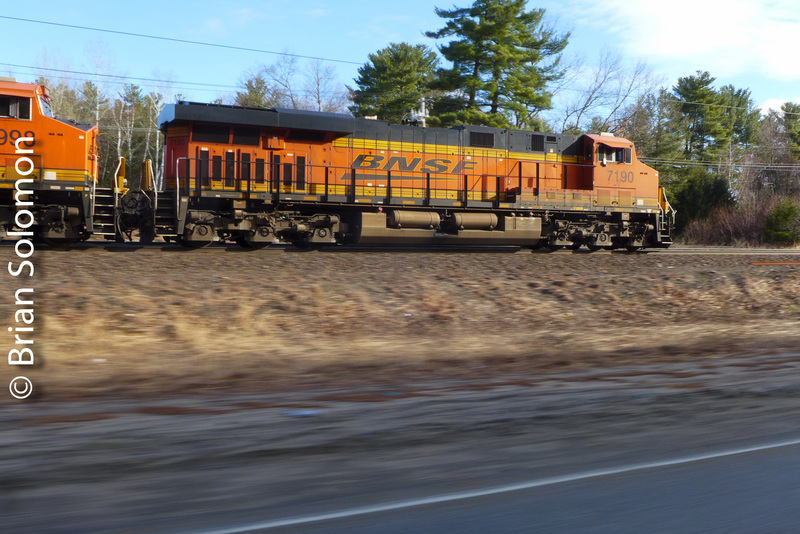 It was seen south of Selkirk and rolling down along the Hudson on CSX’s River Line. But then, just as it seemed that this locomotive note-worthy for its yellow underline, was nearly upon us, word came in that it was at Kearny Yard where it was tied down and without a crew. And so, another day passed, swooshless. Finally, after long last, on the evening of January 13th the famed ‘golden swoosh’ was again on the move. The weather was cold and the sky was dark. Pat and I visited Neshaminy Falls on the old Reading Company. No swoosh. 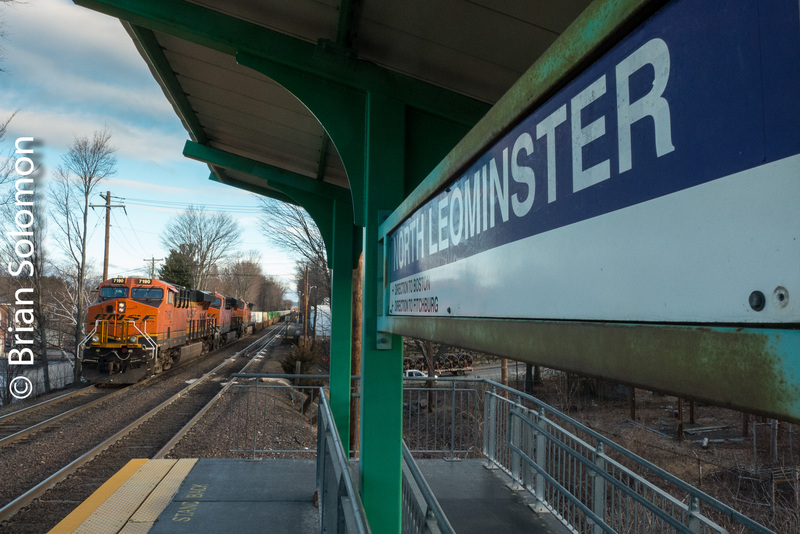 Then to Langhorne where CSX’s Q417 passed in the gloom (144 axles led by engines CSX 8768 and 8836). 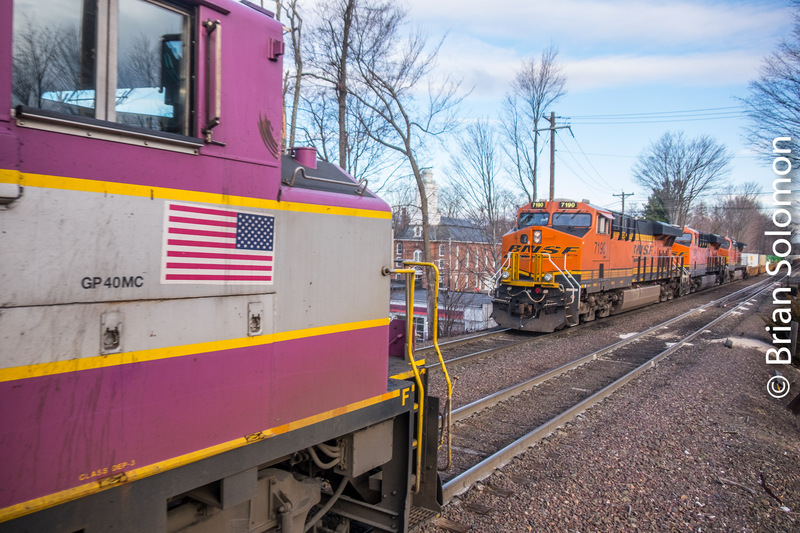 This was followed by CSX’s Q191 led by 5359 and 509 followed by containers. 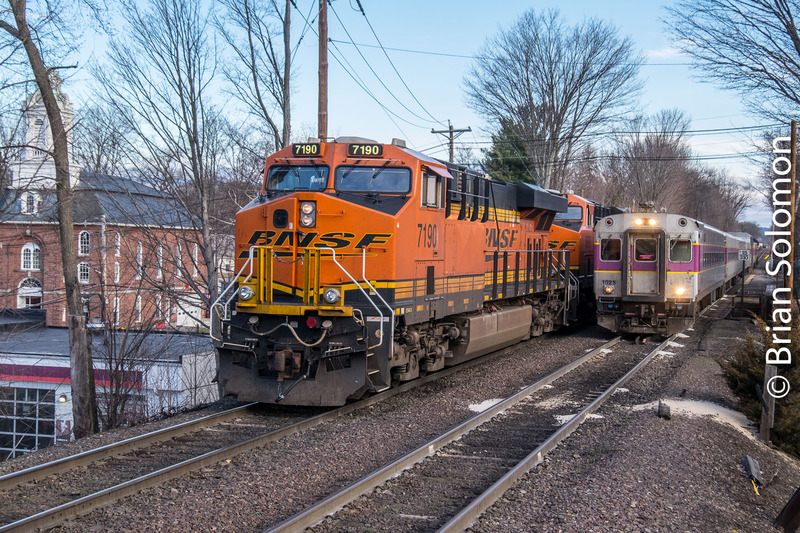 CSX Q191 rolls though Langhorne, Pennsylvania on the old Reading Company Trenton Line on January 13, 2015. Canon EOS 7D photo. In the end we went to Woodbourne: finally a headlight appeared on the horizon. The catenary glistened. and the low chug of a GE engine shook the ground. I racked up the ISO to make some effort to mark its passing. Sort of reminded me of the time Britain’s Queen Elizabeth waved to me on one of her trips through Dublin in 2011. Savanna, Illinois Revisited—June 24, 2010. On a blustery winter morning I find it nice to look through photos made on warm summer afternoons. 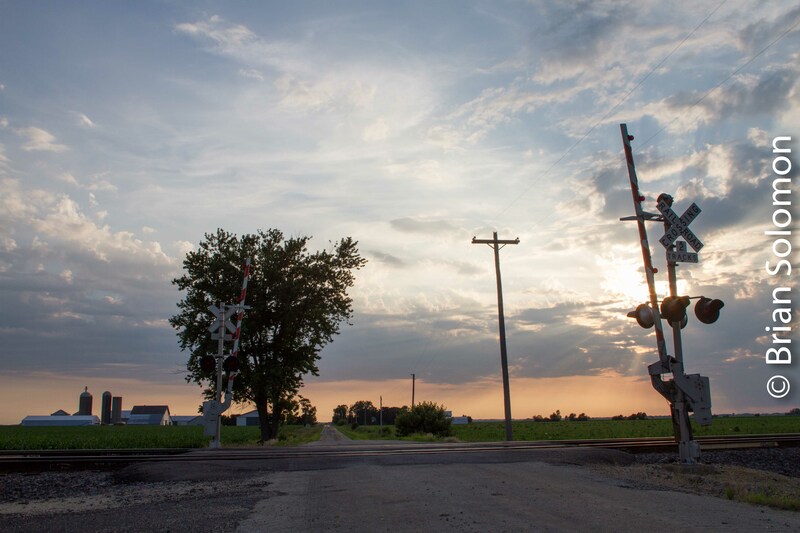 In June 2010, I had just bought my Canon EOS 7D DSLR (digital single lens reflex) and made an extended drive around the Midwest to visit friends, gather materials for a book, and test the camera. This went on for several weeks. On the afternoon of June 24th, I revisited familiar territory along the Mississippi River at Savanna. Not yet fully trusting the digital camera, I exposed a number of slides from the top of the bluff. 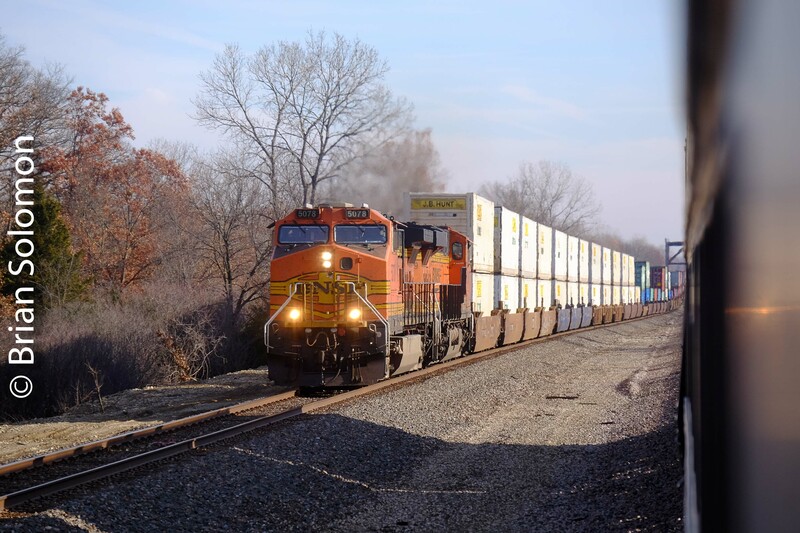 A BNSF double stack container train works along the former Burlington main line near Savanna, Illinois. Exposed with a Canon EOS 7D with 100-400mm lens set at 150mm. ISO 200. 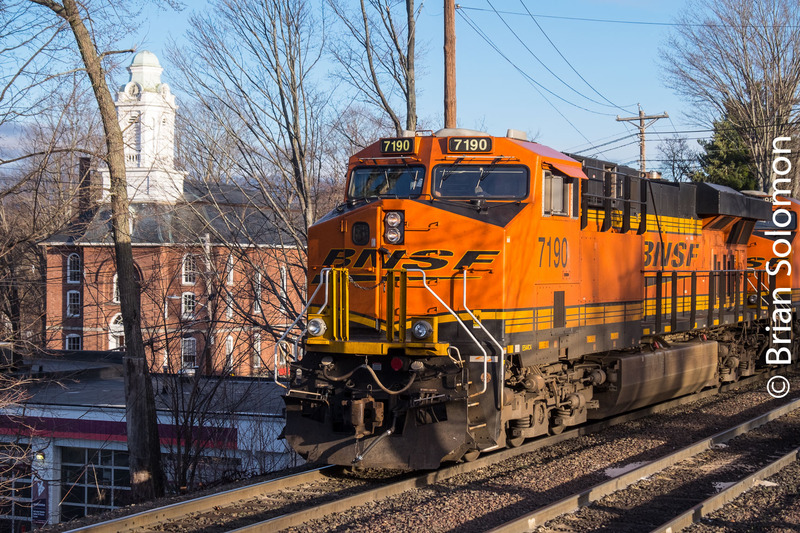 Trailing view of the same stack train; exposed my new EOS 7D with 400mm lens set at 235mm. ISO 200. 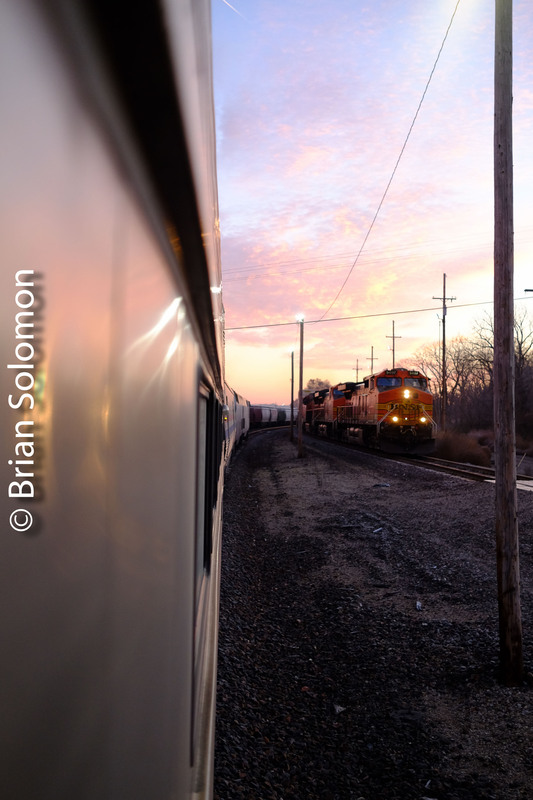 I made this pair of images from river level of an eastward BNSF double stack was headed toward Chicago. Of the two, I much prefer the second photo. For me this better portrays the railroad in its environment with a variety of secondary subjects to add interest. BN SD60Ms westbound at Sentinel Butte. Exposed with a Nikon F3T with f1.8 105mm lens on Kodachrome 25 slide film; shutter and f-stop information unrecorded; metered using a Sekonic Studio Deluxe hand-held light meter. In mid-July 1994, I spent several days photographing along Burlington Northern’s former Northern Pacific mainline in western North Dakota. 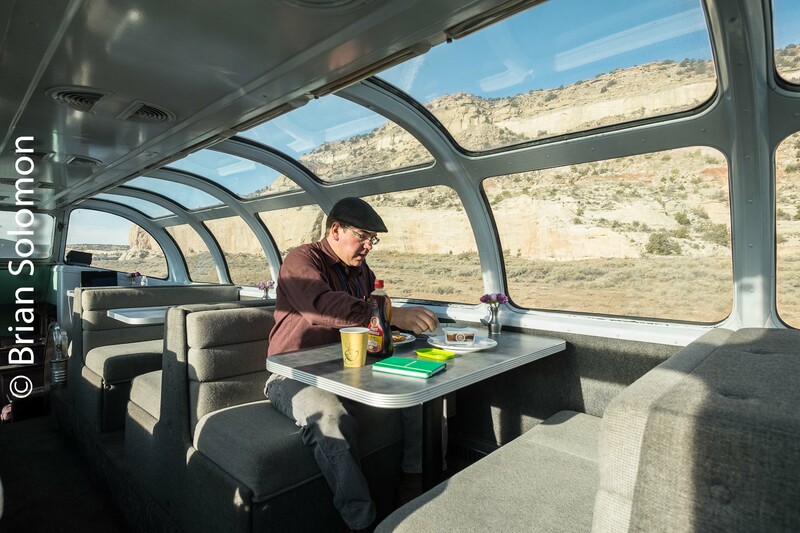 Here the railway snaked through the Badlands, with the landscape characterized by unusual geological formations. On the evening of July 12, 1994, BN sent a fleet of westward empty coal trains (described as ‘coal cars’ on the railroad) over the NP between Mandan, North Dakota and Glendive, Montana. 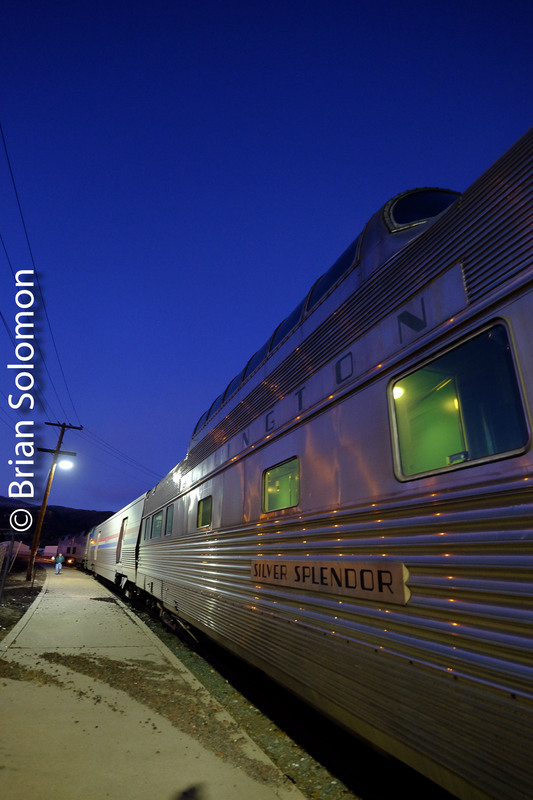 At 7pm I caught this empty led by an SD60M at Sentinel Butte. Fast moving fair weather clouds made for some complicated lighting and a tricky exposure, but ultimately resulted in a more dramatic photograph. This was my second experience with this line. 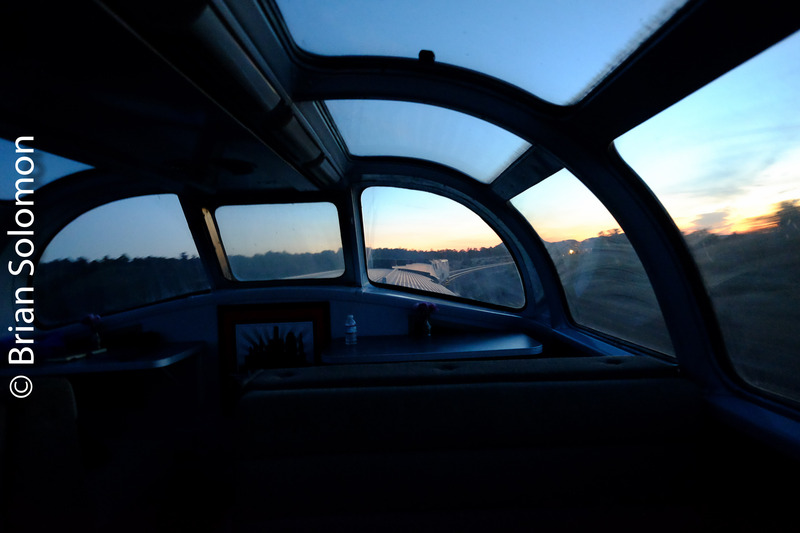 My first was viewing the line from the dome of the North Coast Limited some 24 years earlier. 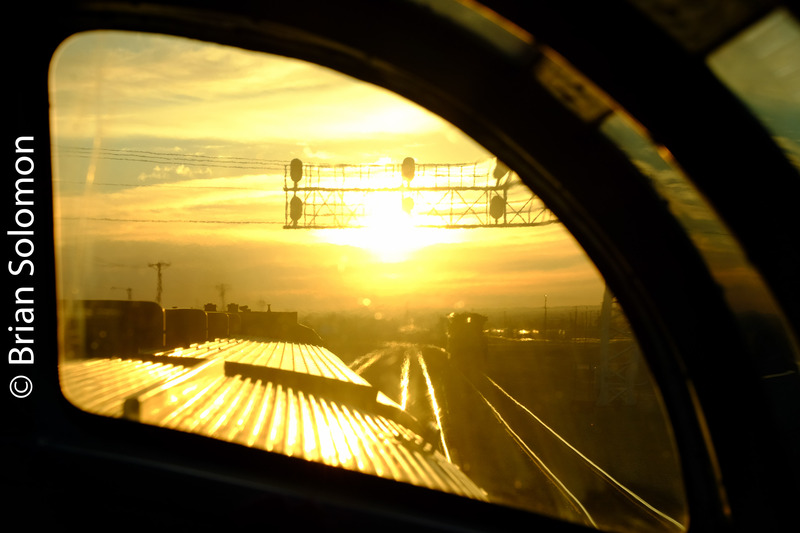 I was only four years old on that trip, but the train ride gave me lasting memories. My dad exposed slides from the dome and dutch-doors of the train and from the Vista dome, but I wasn’t yet working with cameras.